JNN 27 Jan 2015 BAGHDAD : , A top army officer announced troops had “liberated” the Diyala province from ISIS Terrorists. Across the border in Syria , A Kurdish militia has driven Islamic State of Iraq and Syria (ISIS) militants out of the Syrian border town of Kobane after months of heavy fighting, a monitor and spokesman said Monday, dealing a crucial blow to the Takfiri Terrorists. 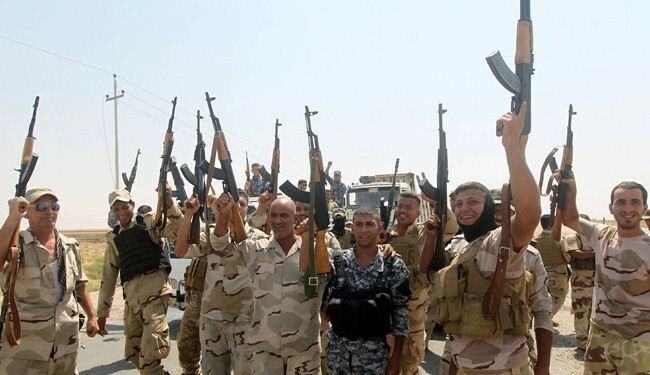 Iraqi the army announced another defeat for ISIS, with the recapture of Diyala province. “We announce the liberation of Diyala from the [ISIS] organisation,” Staff Lieutenant General Abdulamir al-Zaidi said. The general said there would still be clashes however against ISIS in the rural Hamreen mountains, which stretch across multiple provinces, including Diyala. The retaking of the Diyala province is a symbolic victory for Baghdad and could clear the way for further advances against the Takfiri Terrorists. Iraqi forces have regained “complete control of all the cities and districts and subdistricts of Diyala province,” he said. Diyala has seen months of fighting, especially in the Jalawla and Saadiyah areas in the province’s north, which were held by ISIS, and areas near the town of Muqdadiyah, which the Terrorists repeatedly attacked but never took. The last battle for a populated part of the province began last Friday in an area of villages near Muqdadiyah, northeast of Diyala capital Baquba. Zaidi and district council chief Adnan al-Tamimi both said that Iraqi forces are now in control of the entire area. Zaidi said that 58 members of pro-government forces were killed and 248 were wounded in the fighting, while “more than 50” ISIS fighters died. He added that there are thousands of bombs left behind by ISIS in villages north of Muqdadiyah, which will be a major challenge to clear. The victory could see more forces brought to neighboring Salaheddin province, potentially including Terrorist-held Tikrit. ISIS spearheaded a Terrorist offensive that began in the northern city of Mosul in June and swept down to overrun much of Iraq’s north. Iraqi federal forces, Kurdish troops, militiamen, and tribesmen are fighting against the jihadists in various parts of the country. Monday’s announcement does not mean the problem of violence in Diyala —which suffered from frequent attacks even before the ISIS drive —is over. Much will depend on how well Iraqi forces are able to hold retaken territory and efforts to reconstruct areas damaged by the fighting. Despite the successful advances against ISIS, the Iraqi army and pro-government fighters still face major challenges in the battle against the jihadist group, which holds large areas of the country, including the key cities of Mosul, Tikrit and Fallujah. Since ISIS emerged in its current form in 2013, it has captured large swathes of territory in both Syria and Iraq. It has declared an Islamic “caliphate” in territory under its control, and gained a reputation for brutality, including executions and torture. In Syria, the Kurdish advance marked the culmination of a battle lasting more than four months in which nearly 1,800 people were killed. The Britain-based Syrian Observatory for Human Rights (SOHR) monitor said the Kurdish People’s Protection Units (YPG) had pushed ISIS militants from all of Kobane. They “expelled all ISIS fighters from Kobane and have full control of the town,” Observatory director Rami Abdel Rahman said. The monitor said Kurdish forces were carrying out “mopping-up operations” against remaining ISIS forces in the Maqtala district, on the eastern outskirts of the town. YPG forces are “advancing carefully in Maqtala because of the threat of mines and car bombs,” he added. US-led air raids in Iraq have been criticized for making a minimal impact on the ground, despite costing $8.3 million per day according to Pentagon estimates. On Friday, the Pentagon said that ISIS has lost only a tiny fraction of captured territory in Iraq, with only roughly one percent of ISIS-held territory changing hands since the US launched air raids in Iraq on August 8. The officer overseeing the US-led campaign against ISIS, General Lloyd Austin, head of Central Command, told The Wall Street Journal on Thursday that Iraqi forces would be ready to launch a counter-offensive to recapture the northern city of Mosul by the summer. The advance by Kurdish fighters came after 24 hours of heavy bombing by the US-led coalition fighting ISIS in Syria and Iraq. In a statement, the Pentagon said the coalition had carried out 17 air strikes against ISIS positions in Kobane in the 24 hours from January 25 alone. The targets included “tactical units” and “fighting positions” as well as an ISIS vehicle and staging areas, the statement said. The loss of Kobane, also known as Ain al-Arab, would be an important defeat for ISIS. The group has lost 1,196 fighters since it began its advance on the town on September 16, according to the Observatory. At one point, the Terrorists group looked poised to overrun Kobane, which lies on the Syrian-Turkish border. It wielded sophisticated weapons captured from military bases in Syria and Iraq and committed hundreds of fighters to the battle. But Kurdish forces gradually pushed back the Terrorists with the help of a group of fighters from Iraq’s peshmerga fighters. Analysts say the loss of Kobane is both a symbolic and strategic blow for ISIS, which set its sights on the small town in a bid to cement its control over a long stretch of the Syrian-Turkish border. But IS apparent failure in Kobane could put the brakes on its plans for expansion in Syria. “Despite all that manpower, all that sophisticated weaponry, ISIS couldn’t get the city, so it’s a big blow for their plans and its a great achievement for the Kurds,” Kurdish affairs analyst Mutlu Civiroglu told AFP. Fighting near district where Iraqi forces have pushed IS out continued. yesterday the security forces killed two militants wearing suicide vests tried to target a military convoy in Diyala. security forces killed two suicide bombers who tried to get close to a military convoy near Arab Faris village north of Muqdadiyah. While another improvised explosive device was dismantled in southern Baghdad in Mahmudiya on the side of the road, 2 other were wounded by a roadside bomb. In 2 seperate incidents, Two bombings ripped through commercial areas in Iraq’s capital, Baghdad on Sunday, killing at least 10 civilians and wounding dozens, officials said. The deadliest attack took place in the city’s Bab al-Sharji area, where a bomb went off outside a small restaurant, killing seven civilians and wounding 22, a police officer said. Another bombing in the central Sibaa area killed three civilians and wounded 11, he said. A health official confirmed the casualty figures. No group immediately claimed responsibility for the bombings. This entry was posted in Iraq News, Middle East and tagged diyala, Diyala province, Iraq, IS, ISIS, Kobane, Syria. Bookmark the permalink.